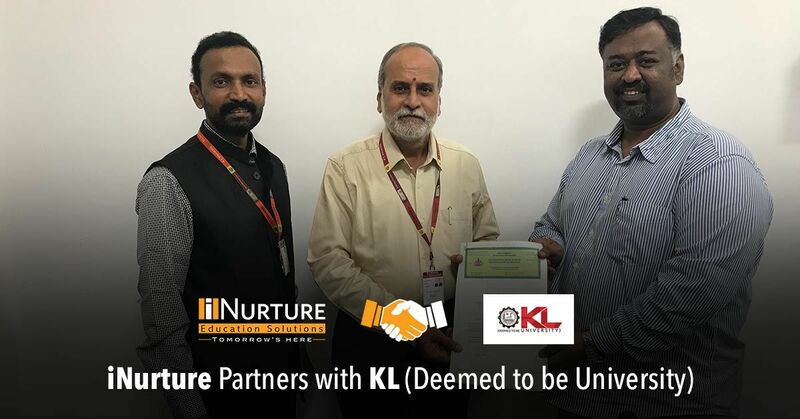 iNurture is delighted to announce its newest partnership KL (Deemed to be University). The MoU, signed on February 04, 2019, offers new-age courses in two of the university’s campuses – Vijayawada and Hyderabad. The signatories included Mr. Sudhanshu Varma, President, Sales and Marketing at iNurture and the Registrar of the University, in the presence of their Director of International Relations and Alliances and Kamalanathan, Regional Manager, iNurture. The Koneru Lakshmaiah Charities was established as a trust in the year 1980 and started KL College of Engineering in the Academic year 1980-81. The trust was converted into a Society by the name Koneru Lakshmaiah Education Foundation in the year 1996. The KL College of Engineering has attained autonomous status in the year 2006 and, in February 2009, the Koneru Lakshmaiah Education Foundation Society was recognized as Deemed to be University. The courses offered at the Vijayawada campus includes 4 BCA and 1 BBA program. At the Hyderabad campus, the university will be offering 2 BCA programs and an Executive PGDC program in Business Analytics.